The Zodiac Sign Aries Man (March 21 - Aipril 20), Aries Personality Traits for Male born under March Zodiac signs. 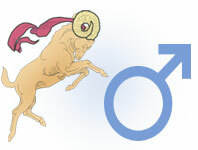 Aries man is an energetic and strong representative of the zodiacal constellation. He does not know what a state of rest is. He always has many new revolutionary ideas, of which, however, not all of them has logical continuation in his actions. Aries man can be entirely not hot, but cold and unemotional outwardly, but under his impenetrable outer shell hides the real volcano of passions. He is swift in his actions and deeds. If Aries conceived something, he will stubbornly move forward and no obstacles will stop him in his path. At worst, he will stuff himself cones, which often happens in his life, but unlike other zodiac sign, Aries does not learn from past mistakes, and he will with stubborn insistence return to this obstacle again and again. Aries man is always creatively gifted, in a rush of inspiration, he is able to create the greatest works of art, which however, are easily destroyed in a storm of self-flagellation, which Aries man often experiences. At such moments, he thinks about his mission in life, and he feels that he has gained nothing of what he could achieve. Aries' "soul-searching" is always held in emotional agony. He is inclined to blaming, despising and accusing himself of all mortal sins. One good thing - Aries man does not stay long in such self-accusatory periods, and after them starts to work more actively and productively. Aries is an independent person, this man does not accept the views of others, and even takes for granted objective arguments in favor of this view - he needs to verify, evaluate and see for himself. Aries man only trusts his intuition and his own eyes, and so it is very difficult to convince this representative of the zodiacal circle in something. Outwardly, Aries man is always smart, he has a sports figure and a youthful face, often looks younger than he really is. With age, Aries man tends to lose shape and acquire "authority" on the tummy, because with time, his life image has become calmer and less mobile. People around do often get the impression that Aries man is not mature - he will forever remain with his children's maximalism, emotionality, capriciousness and directness, admiration to the world, and touchiness, and these "children's" qualities of a quite grown up Aries man attracts people to him - especially women, who can help, pity, and console him. But often, Aries man is simply intolerable for people around him because his selfishness and egocentrism makes him demand for complete submission to his will from people. Aries man can be sensitive, compassionate and generous, and moreover, selflessness in him can wake up under the influence of first impressions from what people's trouble he saw. Sometimes, he is ready to help others but he does so publicly to earn a reputation of a magnanimous and noble man. For Aries man, career is not an empty phrase, he always marks to a place higher than where is currently is, and will do everything to get his way. Aries is very passionate and hot in love. If he falls in love for real, he is sure to win the heart of his darling no matter what. Aries man always loves as if this is his only, first and last love. With his woman, he will be an attentive, affectionate, loyal and honest partner, he will fully devote himself to feelings and even will be ready to get rid of his own shortcomings that hinder normal relations with his woman. Aries man is very romantic, relationship with him will always be memorable, even if they eventually go into the past. All what you have said is very true and yes its very much difficult to convince me ! Full description of Aries Man, character traits and personality characteristic for male Aries.